Sensors Tested – Two Aether-Magnetic Sensors,for the first test, one sensor with Lead Shielding and one with Steel shielding. For the second test, one sensor with Lead shielding and the other sensor in Free Air. Duration of Test – 3 Days ant 24 hours each. Purpose of Test – To compare Copper and Steel shielded transformers with each other and with one in Free Air. Findings – Steel shielding produces the most output. Copper seems to have a little more fine detail. 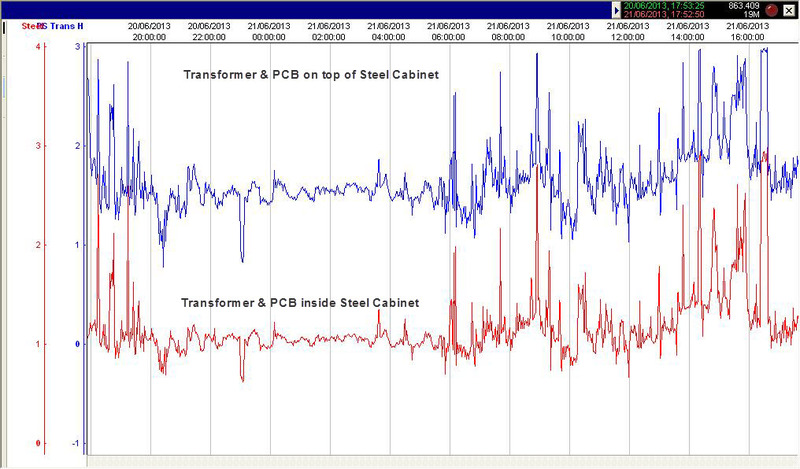 The transformer inside the steel cabinet, has a higher output than the one on top of the steel cabinet. 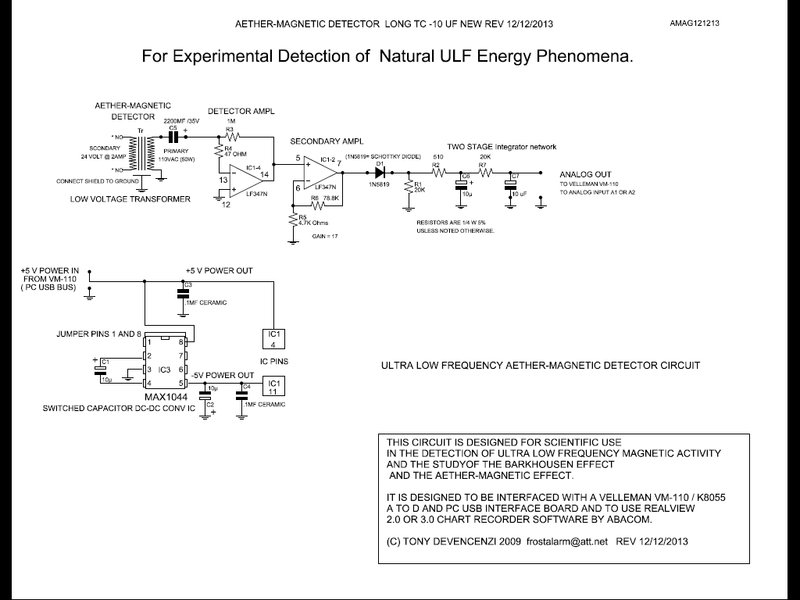 Sensors Tested – Two Aether-Magnetic Sensors, with various sizes of transformer with different shielding, are compared. Duration of Test – About 8 days, 24 hours each on most tests. Purpose of Test – To compare several different size transformers to the 50 VA standard, used in most tests and to compare the effect of Free Air with Alumimum and Steel shielding. 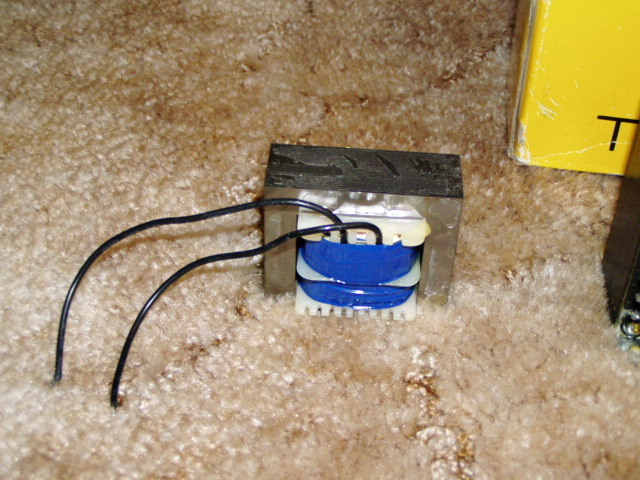 Findings – The Steel Shielded Transformers, have the highest outputs. Aluminum Shielding, produces an output less than Steel Shielding, but more than Free Air. The 50VA Standard transformer, has a greater output than the rest, with the exception of the 60VA Autotransformer. An Autotransformer has only a single tapped winding. This must have something to do with the higher output. Sensors Tested – Two Aether-Magnetic Sensors,for the first test, one sensor with Copper Shielding and one with Aluminum shielding. Duration of Test – 24 hours. Purpose of Test – To compare the effect of Copper and Aluminum Shielding. 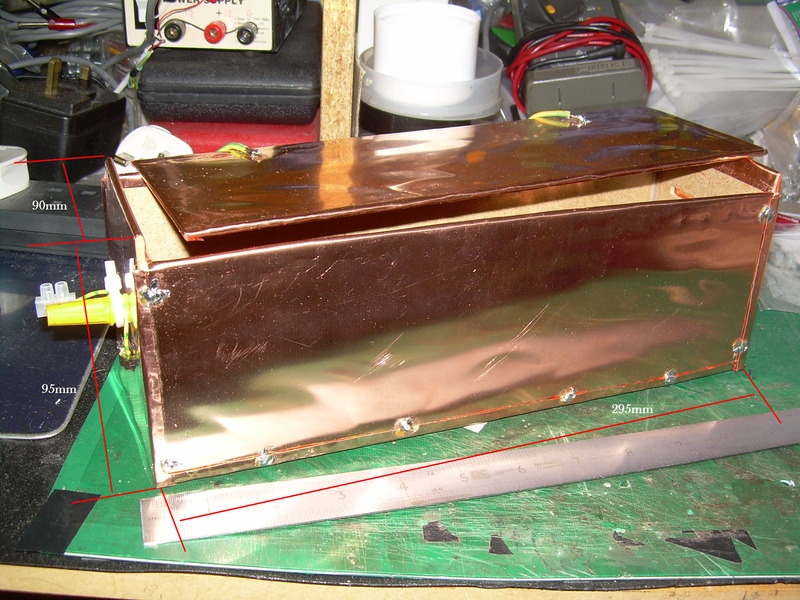 Findings – Both Copper and Aluminum Shielding give results of a similar amplitude. Copper Shielding seems to give a little higher resolution. 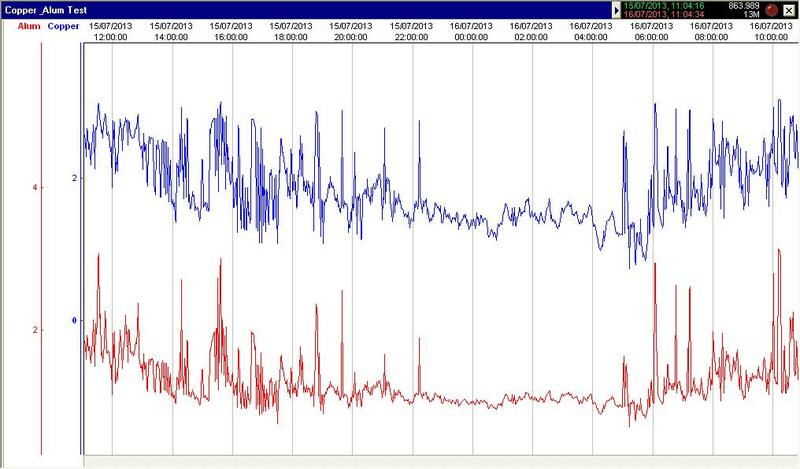 Duration of Test – Two days, Two tests, 24 hours each. Purpose of Test – To compare several different size transformers to the 50 VA standard, used in most tests. 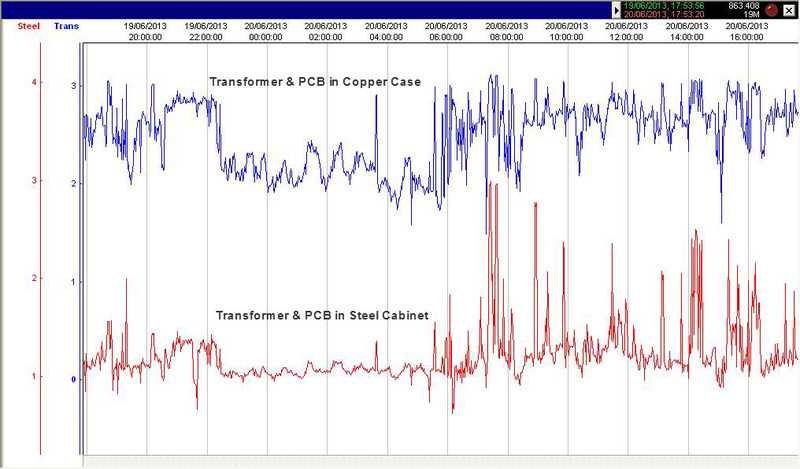 Both of these tests were performed with all transformers in Steel Shielding. 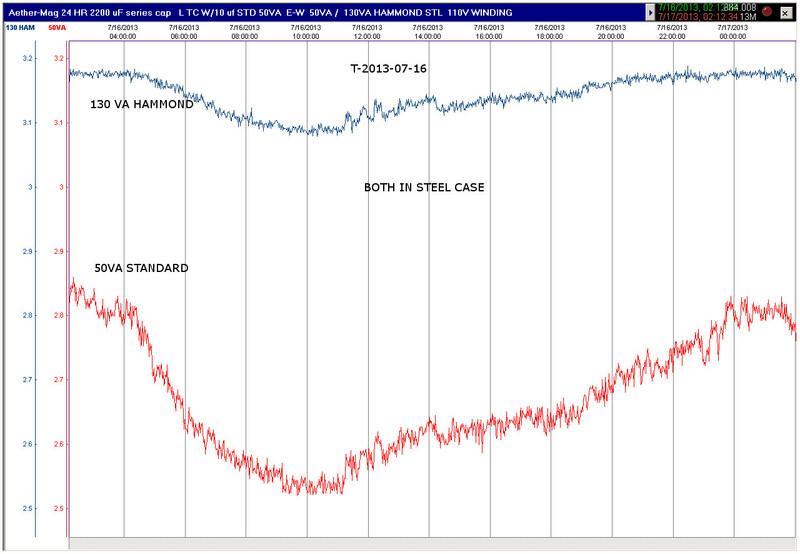 Findings – The 50VA Standard transformer, produces a higher signal output than the 130VA Traiad or the 150VA Hammond, all in steel shielding. Sensors Tested – Two Aether-Magnetic Sensors,for the first test, one sensor with Copper Shielding and one with Steel shielding. Purpose of Test – To compare the effect of Copper and Steel Shielding with sensor operation in Free Air. 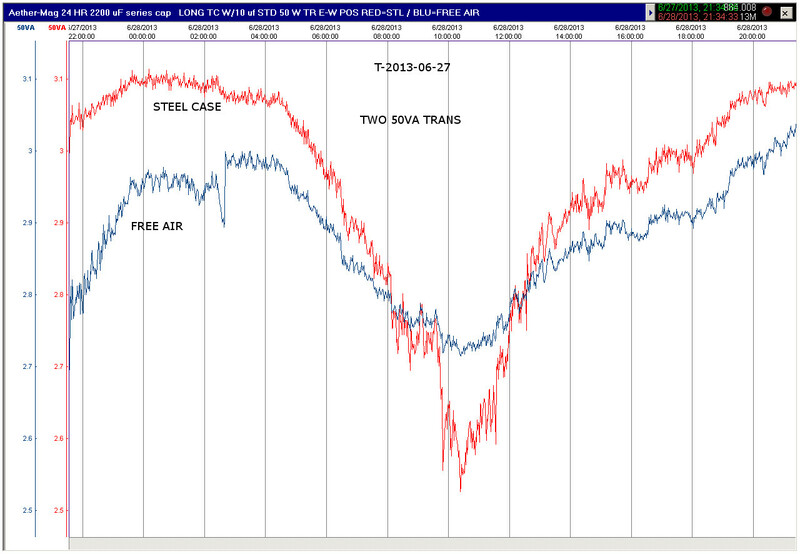 Findings – In some instances, Steel records higher spikes. 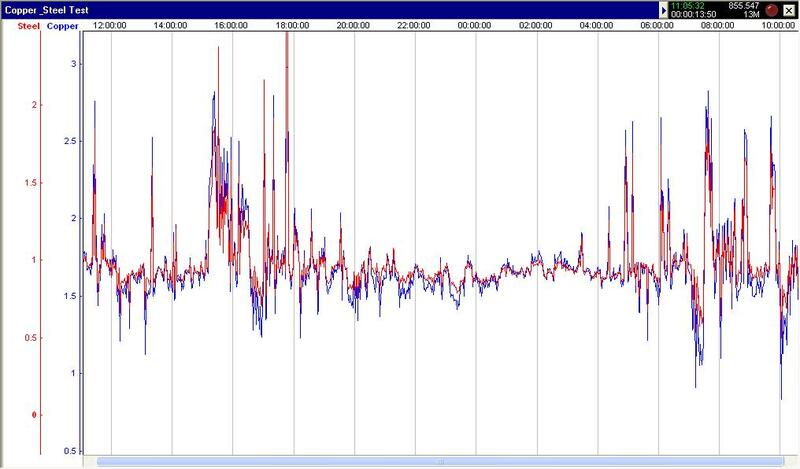 In others, Copper seems to record larger spikes. Both work very well. It appears that Copper records more fine detail.